The English Setter is a medium size breed of dog. It is part of the Setter family, which includes the red Irish Setters, Irish Red and White Setters, and black-and-tan Gordon Setters. 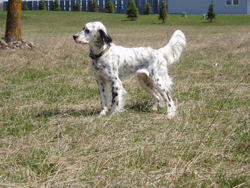 The English Setter is a intelligent hunting dog, but they are not always the easiest to train. English Setters have a good natural bird instinct that tends to distract them in outdoor environments. Their temperament is one known to be on the softer side along with being very sensitive. A gentle but at times strong-willed, mischievous gun dog, bred for a mix of endurance and athleticism, it is used to hunt for game such as quail, pheasant, and grouse. They are energetic and people oriented making them well suited to families who can give them plenty of exercise and attention. Their coat is flat with light feathering and does require regular grooming. 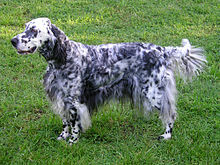 Additional breed information for the English Setter can be found at the American Kennel Club website.